Global number one business incubator network the SETsquared Partnership, which is backed by the University of Bath, has boosted its services to scale-ups by starting an online investment platform. The network has teamed up with London-based Envestors,the fintech for fundraising company, to help its scale-ups secure financial backing. Founded in 2002 and also backed by the universities of Bristol, Exeter, Southampton and Surrey, SETsquared has traditionally run bespoke programmes that supports the earliest stage of a start-up’s life. These help them turn entrepreneurial ideas into businesses by showing how to build a team, write a business plan and launch an investor-ready company. SETsquared’s programme for scale-ups then takes them beyond the start-up phase and helps them to grow to maturity. To complement this, it has licensed Envestry for Networks, the fundraising platform for investment networks, as part of a larger programme which extends its support of scale-up businesses. SETsquared scale-up programme lead for investment and corporate partnerships Jake Ronay said: “SETsquared has already supported over 3,500 entrepreneurs since 2002. Building on this, we wanted to provide another investment channel to help our portfolio of scale-up companies to grow and mature. The platform will showcase scale-up investment opportunities to investors in a secure area and allow them to track opportunities and manage their portfolio. Founded in 2004, Envestors has offices in the UK, the Channel Islands, the UAE and has raised more than £100m for 200-plus companies through its private investor network. 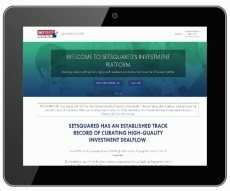 Through its Envestry fundraising platform, SETsquared’s start-ups will get a personalised site to promote deals, raise finance and engage with investors 24 hours a day, 365 days a year. Among businesses to have taken advantage of the platform is Bristol-based disruptive online video advertising agency Coull.